For other uses, see Mansion (disambiguation). A mansion is a large dwelling house. The word itself derives through Old French from the Latin word mansio "dwelling", an abstract noun derived from the verb manere "to dwell". The English word manse originally defined a property large enough for the parish priest to maintain himself, but a mansion is no longer self-sustaining in this way (compare a Roman or medieval villa). Manor comes from the same root—territorial holdings granted to a lord who would "remain" there—hence it is obvious how the word mansion got its meaning. Within an ancient Roman city, aristocratic or just wealthy dwellings might be very extensive, and luxurious. Such mansions on one hill in Rome became so extensive that the term palatial was derived from the name Palatine hill and is the etymological origin of "palace". Mansions of considerable size and state significance are called palaces. Following the fall of Rome the practice of building unfortified villas ceased. Today, the oldest inhabited mansions around the world usually began their existence as fortified castles in the Middle Ages. As social conditions slowly changed and stabilised fortifications were able to be reduced, and over the centuries gave way to comfort. It became fashionable and possible for homes to be beautiful rather than grim and forbidding allowing for the development of the modern mansion. In British English a mansion block refers to a block of flats or apartments designed for the appearance of grandeur. In many parts of Asia, including Hong Kong and Japan, the word mansion also refers to a block of apartments. In modern Japan, a "manshon" (マンション), stemming from the English word "mansion", is used to refer to a multi-unit apartment complex or condominium. In Europe, from the 15th century onwards, a combination of politics and advancements in modern weaponry negated the need for the aristocracy to live in fortified castles. As a result, many were transformed into mansions without defences or demolished and rebuilt in a more modern, undefended style. Due to intermarriage and primogeniture inheritance amongst the aristocracy, it became common for one noble to often own several country houses. These would be visited rotationally throughout the year as their owner pursued the social and sporting circuit from country home to country home. Many owners of a country house would also own a town mansion in their country's capital city. These town mansions were referred to as 'houses' in London, hotels in Paris and palaces in most European cities elsewhere. It might be noted that sometimes the house of a clergyman was called a "mansion house" (e.g., by the Revd James Blair, Commissary in Virginia for the Bishop of London, 1689–1745, a term related to the word "manse" commonly used in the Church of Scotland and in Non-Conformist churches. H.G. Herklots, The Church of England and the American Episcopal Church). As the 16th century progressed, and Renaissance styles of architecture slowly spread across Europe, the last vestiges of castle architecture and life changed; the central points of these great house, great halls, became redundant as owners wished to live separately from their servants, and no longer ate with them in a Great Hall. All evidence and odours of cooking and staff were banished from the principal parts of the house into distant wings, while the owners began to live in airy rooms, above the ground floor, with privacy from their servants, who were now confined, unless required, to their specifically delegated areas—often the ground and uppermost attic floors. This was a period of great social change, as the educated prided themselves on enlightenment. The uses of these edifices paralleled that of the Roman villas. It was vital for powerful people and families to keep in social contact with each other as they were the primary moulders of society. The rounds of visits and entertainments were an essential part of the societal process, as painted in the novels of Jane Austen. State business was often discussed and determined in informal settings. Times of revolution reversed this value. During July/August 1789 a significant number of French country mansions (chateaux) were destroyed by the rural population as part of the Great Fear—a symbolic rejection of the feudal rights and restraints in effect under the ancient régime. Until World War I it was not unusual for a moderately sized mansion in England such as Cliveden to have an indoor staff of 20 and an outside staff of the same size, and in ducal mansions such as Chatsworth House the numbers could be far higher. In the great houses of Italy, the number of retainers was often even greater than in England; whole families plus extended relations would often inhabit warrens of rooms in basements and attics. It is doubtful that a 19th-century Marchesa would even know the exact number of individuals who served her. Most European mansions were also the hub of vast estates. The 19th century saw the continuation of the building of mansions in the United States and Europe. Built by self-made men, these were often smaller than those built by the old European aristocracy. These new builders of mansions did not confine themselves to just the then-fashionable Gothic tastes in architecture, but also experimented with 19th-century versions of older Renaissance and Tudoresque styles; The Breakers in Rhode Island is a fine example of American Renaissance revivalism. During the 19th century, like the major thoroughfares of all important cities, Fifth Avenue in New York City, was lined with mansions. Many of these were designed by the leading architects of the day, often in European gothic styles, and were built by families who were making their fortunes, and thus achieving their social aspirations. However, nearly all of these have now been demolished, thus depriving New York of a boulevard to rival, in the architectural sense, those in Paris, London or Rome—where the many large mansions and palazzi built or remodeled during this era still survive. Mansions built in the countryside were not spared either. One of the most spectacular estates of the U.S., Whitemarsh Hall, was demolished in 1980, along with its extensive gardens, to make way for suburban developments. Grand Federal Style mansions designed by Samuel McIntire inhabit an area that, in 2012, is the largest collection of 17th & 18th century structures in the United States of America. This district in Salem, Massachusetts is called the McIntire Historic District with the center being Chestnut Street. McIntire's training came from his father and from books. He and his brothers, Joseph and Angler, began their careers as housewrights and carpenters while in their teens but, early on, Samuel's work caught the eye of Salem's pre-eminent merchant, Elias Hasket Derby. Over the next quarter century, McIntire built or remodelled a number of homes for Derby and members of his extended family. McIntire also worked occasionally on Derby's vessels, and wasn't averse to fixing a wagon or building a birdhouse if his patron so desired. Hamilton Hall is a National Historic Landmark at 9 Chestnut Street in Salem, Massachusetts. Hamilton Hall was built in 1805 by Samuel McIntire and added to the National Register of Historic Places in 1970. "King" Derby's stamp of approval opened many other doors for McIntire, who went on to design and build mansions for John Gardner, Jerethmiel Peirce, Simon Forrester, and other wealthy Salem shipowners. He also built, on elegant Chestnut Street, a function hall (named for Alexander Hamilton) and church for the town's merchant class. McIntire also designed the former Salem Court House and Registry of Deeds. After 1793, Samuel McIntire worked exclusively in the architectural style developed by Robert Adam in Great Britain and brought to America by the great Boston architect, Charles Bulfinch. The delicate Adamesque style, which emphasized decorative elements and ornamentation, was tailor made for McIntire whose unerring sense of design and proportion was exceeded only by his skill as a woodcarver. Carved swags, rosettes, garlands, and his signature sheaths of wheat dominate wood surfaces in McIntire homes built between 1793 and his death in 1811. 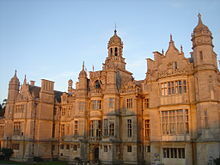 Even in Europe some 19th-century mansions were often built as replicas of older houses, the Château de Ferrières in France was inspired by Mentmore Towers which in turn is a copy of Wollaton Hall. Other mansions were built in the new and innovative styles of the new era such as the arts and crafts style: The Breakers is a pastiche of an Italian Renaissance Palazzo; Waddesdon Manor in Buckinghamshire is a faithful mixture of various French châteaux. One of the most enduring and most frequently copied styles for a mansion is the palladian – particularly so in the 18th century. However, the gothic style was probably the most popular choice of design in the 19th century. The most bizarre example of this was probably Fonthill Abbey which actually set out to imitate the mansions which had truly evolved from medieval gothic abbeys following the Dissolution of the Monasteries in the 16th century. Mansions built during and after the 19th century were seldom supported by the large estates of their predecessors. These new mansions were often built as the week-end retreats of businessmen who commuted to their offices by the new railways, which enabled them to leave the city more easily. The Quinta Gameros is a Porfirian-era mansion located in Chihuahua, Chihuahua, Mexico. The building, designed in a French style, is testimony to an era when France asserted greater soft power in the region than either Spain or Portugal. In Latin America, with its feudal colonial and post-colonial past, the grand rural estate, the Hacienda, Estancia, in Portuguese speaking Brazil Fazenda or Estância, with the mansion as its stately center, is a characteristic feature. Mansions tended to follow European architectural styles. Whereas until the second half of the 19th century, Portugal and Spain as the colonial (or former colonial) powers were the eminent models for architecture and upper-class lifestyle, towards the end of the 19th century they were sometimes replaced by then more dominant powers like France or England. In comparably developed, densely populated countries like Mexico, feudal estates and their mansions were as grand and stately as in the Mediterranean old world, whereas where estates were founded in the sparsely populated remote areas like the Pampa of Argentina or Uruguay, where iron pillars, doors, windows, and furniture had to be brought from Europe by ship and afterwards oxcart, buildings were smaller, but normally still aspiring to evoke a stately impression, often featuring, like their earlier Italian counterparts, a morador. In Venezuela, the traditional Spanish mansions with a garden in the center of the property are usually referred as "Quinta". 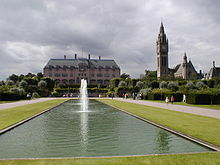 Eaton Hall, England, the Duke of Westminster's 20th-century country house stands alongside the remains of its 19th-century predecessor. 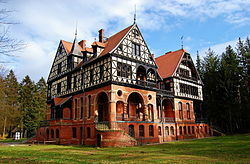 Mansions built during the 20th and 21st centuries usually have specially designed rooms meant to accommodate leisure activities of a particular kind. Many will have a conservatory or greenhouse, while others will have an infinity pool or a home theater. Some have all of these features. The relative importance of these specially designed rooms changes with the times. At the beginning of the 20th century, no true mansion would have been built without a room to house a private library or study, while at the beginning of the 21st century the presence of a room designed for a home theater or cinema is normal. Most recently, mansions have been built with integrated home automation. Some other technology-inclined mansions may even have a bowling alley or a server room. A modern mansion today may not necessarily be limited to a single house standing alone, but like Roman Emperor Nero's Domus Aurea, mansions may be compounds or a grouping of larger houses. The Kennedy Compound is an example of one family building surrounded by large houses on a single plot. In general, whether a house can be called a mansion is contextual—in Manhattan or many cities a 5,000-square-foot (460 m2) house would certainly be described as such, but a similar sized house in the Atlanta suburbs probably would not. Calling a dwelling a mansion indicates a level of grandeur and consumption considerably greater than the norm in that location, with the additional connotation of quality, and correlates highly with the housing patterns of the upper class. ^ Partridge, Eric (1958). Origins: A Short Etymological Dictionary of Modern English. Routledge. p. 465. ISBN 978-1134942176. ^ Girouard, Mark (1978). Life in the English Country House. New Haven, CT: Yale University Press. ISBN 0-300-02273-5. ^ Halliday, F. E. (1967). Cultural History of England. London: Thames and Hudson. p. 166. ^ "Salem Massachusetts – Salem Architecture Salem Architecture: McIntire". Salemweb.com. Retrieved 2013-08-18. ^ "Salem Massachusetts – Salem Architecture 17th & 18th Centuries: Overview". Salemweb.com. Retrieved 2013-08-18. ^ "Hamilton Hall NHL listing info". Tps.cr.nps.gov. 1970-12-30. Archived from the original on 2011-06-06. Retrieved 2013-08-18. Look up mansion in Wiktionary, the free dictionary. Wikimedia Commons has media related to Mansions.